Jeff Krebs (front), General Manager of Schlotterbeck and Foss, recruits from NTI’s Manufacturing Technician program. The Manufacturing Technician class has had many opportunities to meet and tour great Maine companies like Oakhurst Dairy, Bristol Seafood, New England Tech Air, SIGCO, Inc., Shipyard Brewery, and more. Today, we welcomed specialty food manufacturer, Schlotterbeck and Foss to the NTI campus. Schlotterbeck and Foss visited our class today to recruit some of NTI’s Manufacturing Tech students. The chosen students will start at their new jobs immediately after graduating in late September. Earlier this month, students toured the company’s new, state-of-the-art plant in Westbrook. Schlotterbeck & Foss was founded in 1866, and you’ve probably seen their selection of specialty foods and flavorings in local grocery stores. Many private-label products like salad dressings, steak sauces, salsas, and others are manufactured and shipped right from their Westbrook plant! 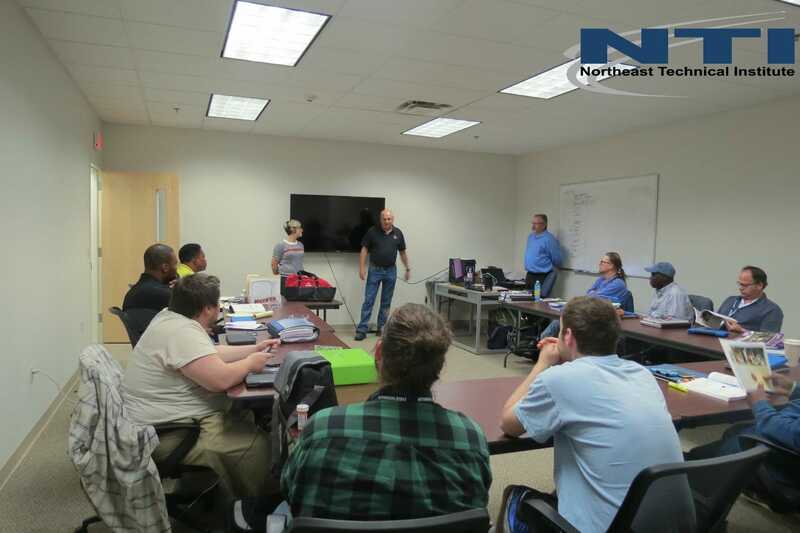 We’re excited for our Manufacturing Technician students, as they prepare to enter their new field of work! Learn more at www.schlotterbeck-foss.com. Could the Manufacturing Industry be for You? In the Manufacturing Technician program you learn: bench-work, precision measurement, blue print reading, industrial safety, technical math, computer applications, lean manufacturing, and more. If working with your hands appeals to you, then contact one of the Admissions staff at NTI to find out more!